Over 40 years of industry experience. 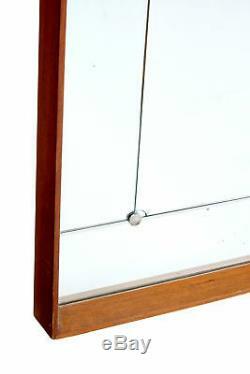 LARGE 1950's TEAK FRAME WALL MIRROR. SCANDINAVIAN LARGE WALL MIRROR CIRCA 1950. 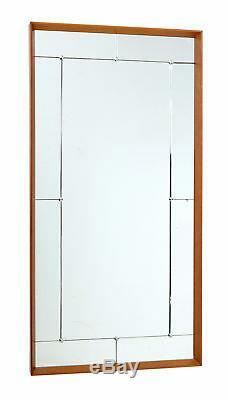 BEVELLED TEAK FRAME, WITH CENTRAL MIRROR SURROUNDED BY MIRRORED PANELS HELD IN PLACE BY SCREW STUDS. 1 SMALL AREA OF PLATE LOSS AND 1 SMALL CHIP WHICH IS PHOTOGRAPHED. 48 inches / 122 cm. 2 inches / 5 cm. 24.5 inches / 62 cm. Excluding Highlands & Islands of Scotland, Northern Ireland, Isle of Man, Isles of Scilly, Jersey & Guernsey. Europe & Rest of UK. Austria, Belgium, Bulgaria, Croatia, Czech Republic, Denmark, Estonia, Finland, France, Germany, Greece, Hungary, Ireland, Italy, Latvia, Lithuania, Luxembourg, Netherlands, Poland, Portugal, Romania, Slovakia, Slovenia, Spain, Sweden. Also Highlands & Islands of Scotland, Northern Ireland, Isle of Man, Isles of Scilly, Jersey & Guernsey. The item "LARGE 1950's TEAK FRAME WALL MIRROR" is in sale since Thursday, December 28, 2017. This item is in the category "Antiques\Antique Furniture\Mirrors\20th Century".